Knees hurt sometimes. It’s okay. Try to improve your form. If that doesn’t work, try a different exercise. I kind of specialize in training people with achy joints. Specific cues have been important for a lot of my clients. Poor technique can place stress on your body that your mind just doesn’t like. So first, when your knee hurts, get a tenured coach to take a look. Their practiced eye might notice something that you haven’t. Fix that issue and see if it clears up. Now, though I love cuing, I need to tell you a secret: sometimes it ain’t enough. Even just in the last week, I’ve seen people deadlift with some terrible back positions. They’re not too concerned about it. They feel fine. And in my years of coaching, I’ve also seen people with near-perfect technique who are still in pain. It doesn’t line up with what makes sense. Good form is supposed to fix these things! I still like to start there, but I have a particular progression of coaching just in case that doesn’t work. If your knee hurts, try to fix your knee movements. So when you’re deadlifting, maybe your knees are coming too far forward. 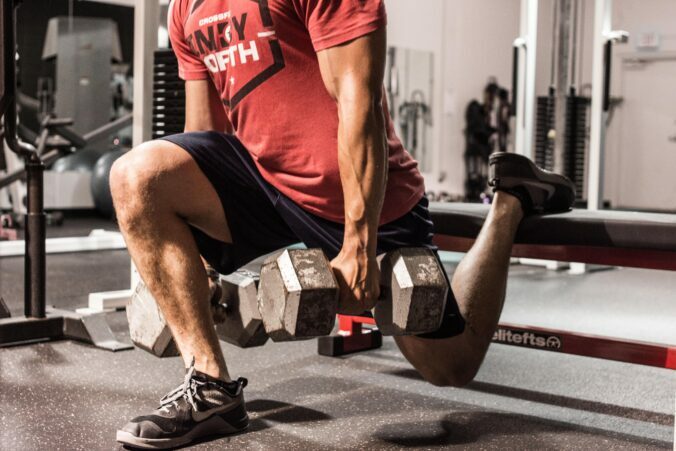 This can place a little extra tension on the kneecap and is commonly what might happen with inexperienced lifters. Okay, but what if the knee is aligned and it still hurts? Let’s try to look around the knee at the foot and the hip. Oh, you’re hips are turning in one direction! Line them back up like headlights pointing at the road and then let’s try again! Often times we trace knee issues back to the hips, back, and feet… and I have even traced a few back to the shoulders. Okay, now we’ve fixed your knees and hips, but you’re still having issues. What do we fix now? Honestly, this might come as a surprise, but maybe this exercise just isn’t right for your at this time. Did you sleep five hours last night? That can make your knee hurt (or more likely to hurt if you want to be technical). Let’s find a replacement exercise. Whenever knees are the issue in lower body exercise, I’m likely to try a single leg exercise, like split squats, step ups, and lunging variations. Your knee has a little more space to play with in these exercises, and loading one leg at a time makes it easy to really train that leg. Enter muscle growth phase. If your knee hurts, get a coach to look at your technique and fix any errors. If that doesn’t help, try a different exercise (like a single leg exercise).